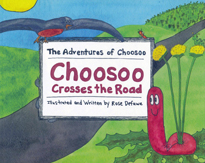 Written and illustrated by Rose Defawe The Adventures of Choosoo - Choosoo Crosses the Road (2011) is the delightful story of an earthworm looking for a new home. The book introduces young readers to environmental issues and makes an impassioned plea for driving less and using non-motorized transport instead. The book is available through the Bainbridge Public Library local authors collection.